Ah the lowly single use camera. If you're under 25, there's a good chance you've never even picked one up. To the rest of us, at one time or another the single use (or throw away) camera was an essential travel item for summer vacations and social gatherings. For the uninitiated, they include 27 shots, a fixed focus plastic lens, a built in flash, and no other adjustable adjustable controls whatsoever. I worked at a photo lab for a few years, and must have seen thousands of these little cameras get developed in that time. The underwater single use cameras were especially popular, though the results often left much to be desired in terms of image quality. I vaguely remember being under ten years old and using one on summer vacation one year, but other than that I'd never given them much thought. That all changed when I had to send my Zeiss Ikon ZM rangefinder out for repair for a few months, and wanted a temporary substitute that I could use for candid travel snapshots. Enter the Ilford HP5 Single Use Camera. The biggest draw for me here is the film itself. You'd be hard pressed to find a more classic emulsion than Ilford HP5 Plus 400. With it's beautiful grain structure, wide latitude (which is pretty important when you can't control exposure on the camera), and timeless look, HP5 is about as good as it gets in black and white film photography. Now, I normally take pictures with my favourite focal length, which is 50mm. A 50mm lens on a 35mm camera is pretty close to the same perspective that the human eye sees. When traveling however, it can be an advantage to use something a little wider to capture an entire scene. 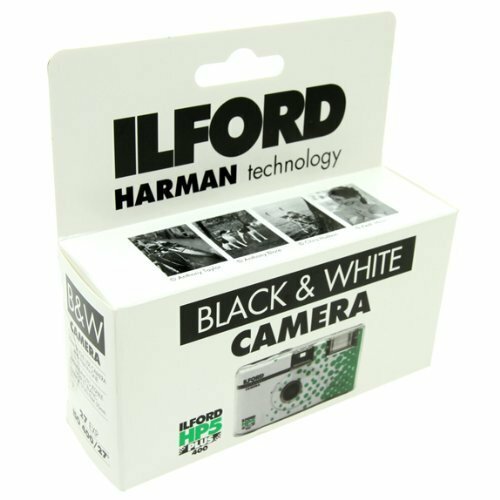 The Ilford camera comes with a semi-wide angle 30mm-ish lens, similar to what your iPhone captures in terms of field of view. In practice, I actually really appreciated the wider perspective the camera afforded me. Make no mistake, single use cameras aren't suitable for any kind of professional work, mainly due to the variety of "happy accidents" that they can produce. It's easy to accidentally place your finger on the lens, and weird light flares are often par for the course. Aside from that, I do recommend playing with cameras like these on your next trip. They're a lot of fun, very portable, and will definitely change how you approach making images. If the uncertainty of a throw away camera is off putting, Ilford HP5 Plus in general is an extremely reliable film that's also available in 35mm, 120mm medium format, and even large format 4x5 varieties. What about you? What are your experiences with single use cameras or black and white film in general?